Play Better Pool: Mastering the Basics Dramatically improve your game with the help of two of the top pool instructors in America. 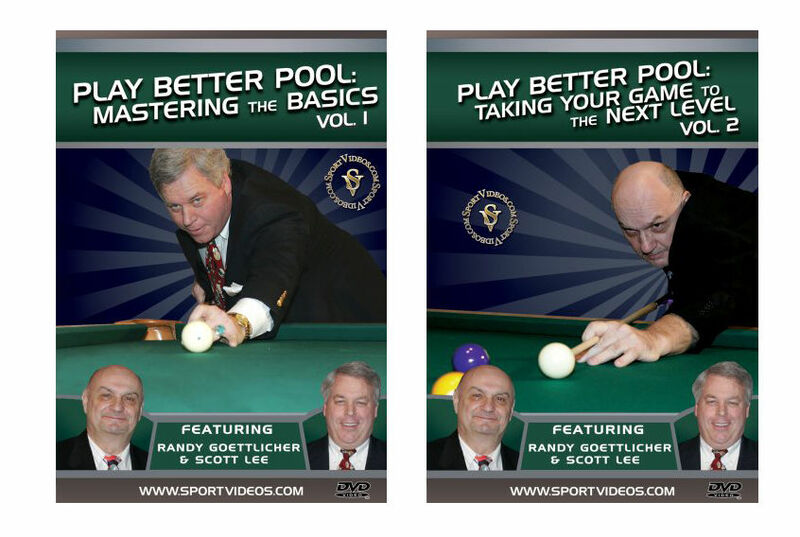 In this comprehensive DVD, Randy Goettlicher and Scott Lee detail the essential principles necessary to excel at pool. Among the topics covered are: set, pause, finish; stance; common cueing errors; pre-shot routines; speed control; the stop shot and tangent line. You will learn step by step how to build a smooth, repeatable and sustainable stroke, as well as the subtle nuances of how to play a particular game. In the Special Features section, you will also learn numerous impressive trick shots from Scott Lee. This DVD is an essential resource for any serious pool player! 105 minutes. Play Better Pool: Taking Your Game to the Next Level Take your game to the advanced level with the help of two of the top pool instructors in America. In this DVD, Randy Goettlicher and Scott Lee demonstrate and explain everything it takes to become a top level player. Among the topics covered are: 8-ball rules; 9-ball rules; cue ball quantification; three rail kicking system; two rail kicking system; one rail kicking system; aiming; 8-ball and 9-ball practice games; and frequently asked pool questions. In the Special Features section, you will also learn numerous impressive trick shots from Scott Lee. This DVD is an excellent training resource for any serious pool player! 71 minutes.